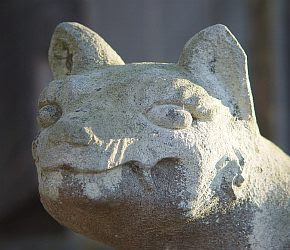 The messenger of the Gods from Mitsumine Shrine is the Japanese Wolf, kami no tsukai, ookami, 「神使: 狼 おおかみ」. The wolf is often symbolically linked with mountain kami in Shinto (the most famous example being the wolf kami of Mitsumine Shrine in the town of Chichibu in Saitama Prefecture). Interesting is a report by Hirata Atsutane (1776-1843) in one of his lectures on "the Superiority of the Ancients". In the Ômine and Mitsumine mountains, he avers, "there are many wolves which are called the messengers of the gods of the mountains, and people from other parts of the country come and, applying through the guards of these mountains, choose and borrow one of these wolves as a defence against fire. That is to say they only arrange to borrow it and do not take a wolf to their place. And from the day of borrowing they offer daily food to the spirit of the wolf. But if through neglect several days pass without food being offered then the wolf chosen becomes thin, emaciated, and weak. There is a case where a man I know borrowed a wolf and neglected to offer food for four or five days, and misfortune came to him from that source and he was fearfully surprised." 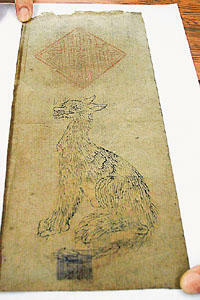 Prior to the Meiji Restoration (1868),　Japanese worshiped this canine, whether wolf or mountain dog. 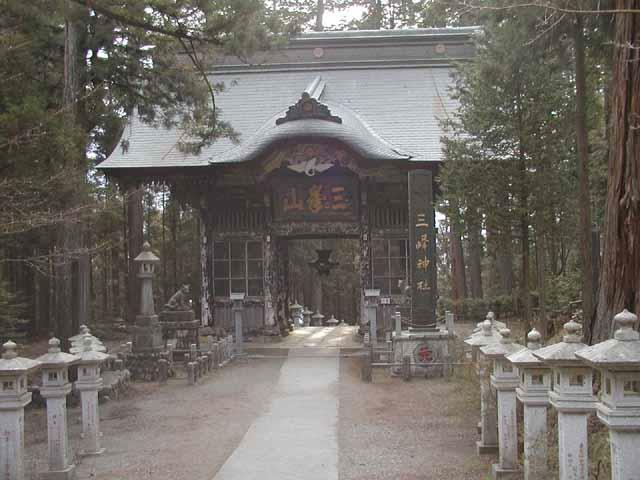 The Shinto shrine Mitsumine Jinja was of particular importance in wolf worship and has　been associated with both Shugenoo, or traditions of mountain asceticism, and wolf iconography. 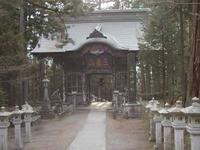 Mitsumine Jinja stands near the village of Ootaki, in Saitama Prefecture. The main gods worshiped at the shrine are Izanagi and Izanami, two powerful deities who feature in the Japanese creation myth. Tradition holds that the shrine was built by none other than Prince Yamatotakeru, the legendary unifier of Japan, who, during pacification campaigns in central Honshu, wandered astray of the Karisaka mountain-pass road. The prince found himself lost until a white-wolf god led him out of the mountains, hence the shrine’s connection with wolves. Over time the three peaks became objects of worship. Spring thaws caused swift and pure rivers to flow from the mountains and, not surprisingly, local farmers revered the mountains in their agrarian traditions. Today Mitsumine Jinja sits at about 1,080 meters, on the northwestern slope of Myoo-ga-take, having been moved there from Kumotori-yama after the Meiji Restoration. and other iconography, ranging from statues to hanging-style prints, were distributed at Mitsumine Jinja. The great majority of these images feature two wolves facing each other. The wolf on the right usually has its mouth open, symbolizing a, or the sound of an open mouth, and iconographically representing the first letter of the ancient Siddhamatrika script used to write Sanskrit. The wolf on the left has its mouth closed, symbolizing un, or the sound of a closed mouth. Although abstract, the three sounds contained in the sound on, or aun in Japanese, refer to the three states of consciousness: a being the first state, of waking consciousness; u being the second state, of dreaming consciousness; and n being the third state, of sleeping consciousness. (More about Aum (阿吽) A-Un, Om). When placed together, these two wolves strike poses similar to those of the Deva Kings, Nioo in Japanese, two fierce Buddhist guardian deities who protect temple precincts. These o-fuda and other iconography were distributed by shrines; and some o-fuda, called shishiyoke (猪よけ　boar deterrents), were used by peasants to spare their crops from the ravages of deer and wild boar. The Ainu, the indigenous inhabitants of Hokkaido, knew the Hokkaido wolf as the high-ranking god Horkew Kamuy. In Hokkaido’s Tokachi and Hidaka regions, there flourished versions of a myth about a white wolf that mated with a goddess, or sometimes a Japanese court lady, and the offspring from this union became the ancestors of the Ainu people. Several regional versions of this origin myth exist, and some feature a white dog rather than a white wolf. The difference between wolves and dogs appears to have been less important to the Ainu, since both wolves and dogs inhabited much the same space in their classifying imagination. One version of this myth from Shizunai, in the Hidaka region, explains that the god of the mountain Poroshiri-dake, Retaruseta Kamuy (the white-wolf god), could not find a auitable mate, even though he searched the entire island. So Retaruseta Kamuy summoned his divine powers, seeing all the way to lands across the seas, and in time spotted a mate in a distant country. Again drawing on his divine powers, he coerced the woman to get in a small boat, cross the seas, and once on the island become his wife. 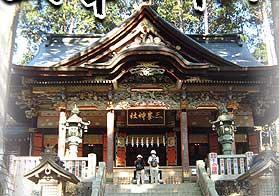 From this union, it is said, the Ainu people were born. You can see the two wolves at the gate, click photo for enlargement. Mitsumine-sama, the farmer's name for the Deity worshipped at Mitsumine Shrine. They also call it Big Mouth God (ooguchi kami) or WanWan Sama (barking like a dog).
. Oku Osaki Jinja 奥御前神社 Kume, Okayama . yama-inu, yamainu　山犬、豺 "mountain dog" .